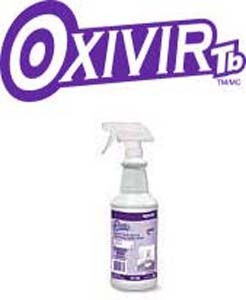 Protects against germs and odors on virtually any surface. Anti-microbial action kills allergy and disease causing germs, bacteria, fungi, mold and mildew. Suitable for hospital and health care institutions, animal care facilities, etc. Used in operating rooms, labs, morgues, shower stalls, etc. Excellent for decontaminating textiles, mattresses, bedding, etc. Professionals choose Mircoban Disinfectant Spray when clearance testing is a must. Microban Disinfectant Spray is registered with the E.P.A., USDA/N.S.F. and is approved for use by professional cleaners and restorers. May be fogged into air ducts to help prevent spread of airborne bacteria and odors. Apply with sprayer, foggers, automated misting systems as a broad specturm bactericide, mold and mildewcide, fungicide and deodorizing agent to previously cleaned surfaces.